“Yap youeeeeeeeeeeeeeeeeeeeeeeeeeeeeeee!” My husband yelled as we crested the top of the hill, perching over a steep decline. Down and down we drove, leveling only for a few seconds before climbing back up again. The roads were like roller coasters, rolling up and down, steep and narrow, with views far and near. We could see far and watch as impatient drivers moved into the oncoming lane, counting on speed and skill and luck to carry them beyond the slower car and safely back into the left lane only just in time. 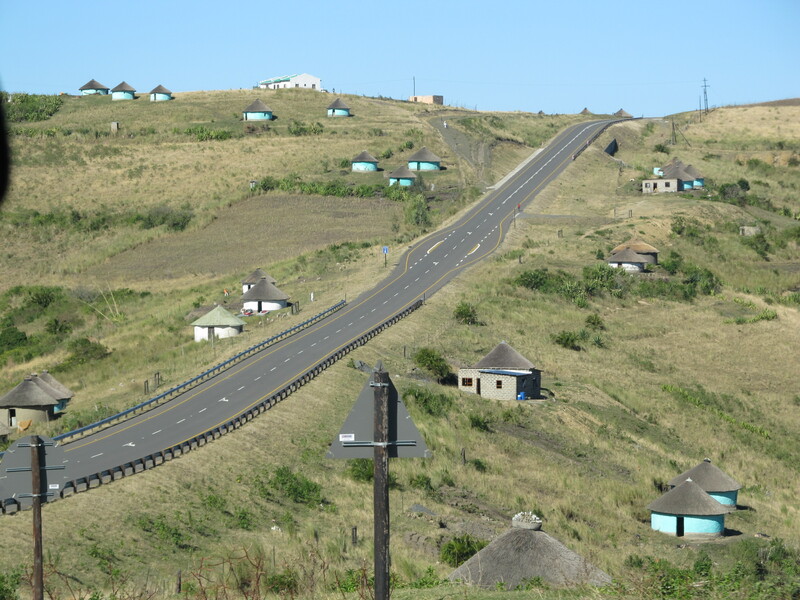 We were driving in South Africa on the wrong side of the road (as far as we Americans were concerned) from the Wild Coast to Lesotho. “Yap youeeeeeeee,” he yelled, as our speed increased to pass the slow moving truck, passing to the right, moving into the opposite lane, moving fast and faster, our speed well exceeding the speed limit until we slid in front of the truck just as that car coming toward us was getting near. We played chicken more than once, so many times that it became blasé to the driver, my husband. Sometimes I shut my eyes, intimidated by the signs, “High Accident Zone,” intimidated by the website I’d stumbled across which detailed the roads with the highest fatalities (this was one of them). Or I’d look beyond the pavement, at the termite mounds, the grasses, the clothes lines adding color to the earthen shacks and huts around them, and hope for the best. For road safety advice for foreigners driving in South Africa, check out the website: www.arrivealive.co.za.